Bankruptcy attorney mailers have become increasingly popular in the last couple of years. You may find 4-5 or more of these mail flyers in your mailbox within a week of a creditor filing a lawsuit against you. Can you trust these bankruptcy mail flyers? Should you just choose between which mailer’s office looks best if you are filing for bankruptcy? Choosing between bankruptcy mail flyers may be a very bad idea. Let me explain. If you need to file bankruptcy, you should do what is best for YOU. Bankruptcy mailers are only advertising material. The flyers rarely reveal the true qualities of the law office. These mailers are designed for one main purpose: getting you into the office. The flyer will be designed to capture your interest in any way possible. They also will make claims frequently that sound better than what the office is really offering. Do not trust the low-cost or $0 down bankruptcy claims: they are usually misleading or exaggerated. You may actually be led to going to the most expensive office in town! These mail flyers are also unreliable for revealing the true character, reputation, and experience of the law office. Some bankruptcy mail flyers will be more accurate than others about what is truly being offered. You will not, however, be able to verify the claims only by the mailer. Remember, ALL bankruptcy offices need new clients to stay in business. The full gambit of offices could be sending you a mailer. These bankruptcy offices will likely range from the affordable to the most expensive, the friendly to the cold, and the experienced to the newly opened office. For the most part, you will do much better with some quick research than just choosing a mailer option. Using the internet is one of the best ways to make your decision. Look at the disclosures (or lack thereof) of the bankruptcy office’s fees. If the website is not upfront or sounds too good to be true, it may also be an inaccurate presentation similar to the mailer. Use common sense. If the website is helpful and inviting, you may likely find the office to be similar once you attend the consultation. When you find a place that meets your standards or looks genuinely desirable, give that office a call or do more research. You can usually get the feel of the place over the phone and also ask for more information. Another good source better than bankruptcy flyers are reviews and referrals. You may be surprised: ask your friends and family who to call. They will probably know somebody who can help you. They may have had a good personal experience themselves. In addition, it is common to find online reviews for most services. Although these reviews are not always accurate, they may also give you a much better feel as to the nature of the office. Remember the old adage when it comes to bankruptcy flyers, “don’t call us, we’ll call you.” Any sales person that approaches you is likely to not be selling exactly what you are desiring. When people truly want something (including a service), they usually just go searching and then buy it. Do your research. You will likely save money and possibly even prevent a bad experience. Bymaster Bankruptcy Law Offices offers free consultations. Call us today – 317-769-2244. 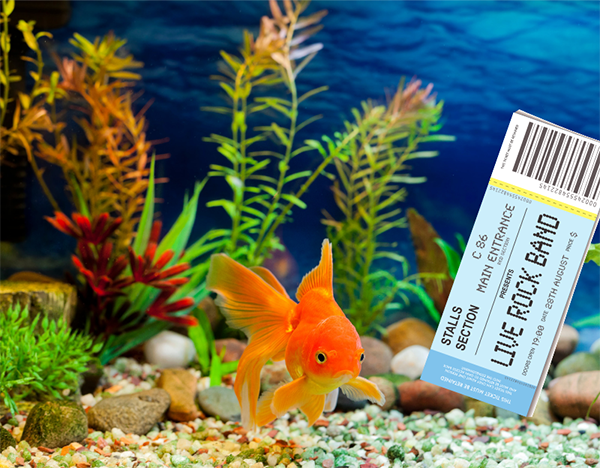 Fishtanks and concert trips – how can these things have anything to do with bankruptcy? The answer actually is they do not have anything to do with bankruptcy! That is the problem: these are perfect examples of expenses that your bankruptcy trustee will not accept if they occurred shortly before your bankruptcy case was filed. During bankruptcy planning, your attorney may instruct you to only spend your money only on normal and necessary expenses. Examples of these expenses would be things like food, shelter, or transportation. Normal expenses that your family faces are usually acceptable in the analysis. However, your bankruptcy attorney will usually warn you against such things as paying back relatives or paying back creditors in a preferential way. In fact, your attorney will probably give you a whole list of warnings and instructions that describe how to not violate this principle before you file your case. Over the years, I have found the perfect two examples of unnecessary expenses. First, if you purchase a 5000 gallon fish tank before you file, you will likely be violating this principle. The fish tank has nothing to do with your normal needs and necessary expenses. In fact, it even creates unnecessary future expense for the maintenance and support of this hobby item. Planning a trip to attend a concert in another state is another perfect example of an unnecessary expense. This expense would be entirely for entertainment value. There are no sick relatives you are visiting in the trip. No business activity will occur during the trip. The trip would be purely for experience and entertainment sake: it has no normal or necessary element to it. If you were unsure whether an expense will be deemed normal and necessary, you need to always ask your attorney. It is very easy to justify an expense because it is what you were already planning to do with your remaining money. The normal rules to how you spend your money do not apply if you are contemplating bankruptcy. Ask your attorney. You do not need to be planning to do something wrong to make a mistake. If you make a mistake, it probably will not ruin your bankruptcy case. However, as your attorney will tell you, it could make the total “cost” of your bankruptcy increase greatly. You could face being required to pay any incorrectly spent money back to the trustee in your bankruptcy case. I hear the same question frequently: why does Chapter 11 bankruptcy cost so much? Chapter 11 bankruptcy always costs much more than the conventional Chapter 7 or Chapter 13 case. The reason why Chapter 11 costs so much is because it is extensively-monitored and always “custom” in nature. Chapter 11 costs so much because it is extensively-monitored by the United States Trustee’s office. In fact, a good part of the initial filing fee goes towards the first payment of this cost. In many Chapter 11 cases, the United States Trustee will directly conduct the initial meeting of creditors. The United States Trustee will monitor the entire case, requiring a quarterly or monthly payment for these services. Public reports that the United States Trustee will review will also be required to be filed each month. The monthly operating reports also cause the total cost of the case to increase, making the case even more expensive. Almost every aspect of a Chapter 11 case must be monitored and conducted with court-approval. This also requires the expensive and time-consuming necessity of filing first-day motions, various public reports, and a host of other requirements. In addition, almost all Chapter 11 items require an in-person, Judge-approved court hearing to occur. Truly on every level – from public reports to Judge and United States Trustee supervision – every aspect of Chapter 11 is meticulously monitored, increasing the cost of the case. Chapter 11 costs so much because it is almost always entirely “custom” in nature. There are virtually no “cookie-cutter” cases that use the same process that can be quickly replicated. This aspect of Chapter 11 is probably the most cost-generating aspect of the endeavor. Essentially, all plans of reorganization are “custom” negotiated and drafted to be presented to the court. This makes the entire process of Chapter 11 very expensive to complete. Certain defaults plans do actually exist such as local small-business reorganization plans. Also, your attorney can usually take advantage of the process they have used in the past (or can also examine what other local firms are doing in that district with the public record and local rules). Form sets are also available through programs to speed up the process. Even with all these attorney resources, the process is still a unique and “custom” in nature to avoid high legal expenses. Chapter 11 Costs How Much Usually? Your type of case and geographical area will usually determine how much Chapter 11 costs more than anything else. The court cost (filing fee) for a Chapter 11 case is currently $1717. In addition to this, there will be a periodic fee (usually quarterly) that must be paid to the United States Trustee’s office during the entirety of the case. Attorneys can frequently charge $25,000 to $50,000 as a retainer on Chapter 11 cases. Usually, additional fees will be required later in the case if they are court approved. The cost of a complex Chapter 11 case can GREATLY exceed these amounts, sometimes ranging into the hundreds of thousands or even millions upon completion of the case. In addition, very simple Chapter 11 cases can sometimes occur for less than the amounts stated above. It would be extremely rare, however, even in the most simple of cases for an attorney to charge less than $5,000 to $10,000 for an initial retainer (with further billing to follow). Chapter 11 usually always costs considerably more than it’s Chapter 7 or Chapter 13 counterpart, regardless of the situation. What actually happens during bankruptcy is the release (or total forgiveness) of your debts. To get this release, you must provide some financial documents and official government paperwork to formally request that your debts be forgiven. After the full bankruptcy process is completed, you will receive a “discharge” that permanently eliminates your debt. You will be required to provide certain paperwork including a list of your creditors, your current income, and at least two years of taxes. After you have provided the paperwork and take a small required bankruptcy class, you can then review and sign your petition with your attorney. This gets everything ready so that your case can be filed. There are usually also court costs and attorney fees required for the process as well. You or your bankruptcy attorney will then file your bankruptcy request with the federal court. During a filing, you must submit a full, completed bankruptcy petition that is accompanied with other required paperwork and documentation. Usually, you must also submit your last 60 days of income and a copy of the certificate that shows that you have taken the required bankruptcy class. After the case is filed, a trustee (a bankruptcy-reviewer) will automatically be assigned to the matter to review the case. Also, a bankruptcy meeting will be set out 30-40 days into the futurewhere you will briefly meet with this trustee and any creditors who wish toattend. After the case is filed, you will go to this single bankruptcy meeting. The trustee will ask you a series of questions related to your case. Even though the bankruptcy case is already filed, certain follow-up work will be required with your attorney and sometimes the trustee. This follow-up work will likely occur both before and after the bankruptcy meeting. It is critically important to follow the instructions of your attorney and bankruptcy trustee to make sure that your Chapter 7 Bankruptcy is successful. You also must take your second bankruptcy class and make sure that the certificate is filed with the court. Do You Need Bankruptcy to Actually Happen for You? The above description of the chapter 7 bankruptcy process hopefully dispels any initial fear of what actually happens during bankruptcy. The bankruptcy process is not as stressful as you may think. In fact, the bankruptcy process usually instead brings desperately-needed stress relief. Contact a bankruptcy attorney for a free consultation to allow you to consider whether bankruptcy is right for you. What are clear signs that you need to file for bankruptcy? This question can be answered by in a few basic ways. There are three basic signs that strongly indicate that bankruptcy is something that you may want to consider. Are your finances currently impossible? If you believe that you will be in the same place still in 2 to 3 years, you should consider bankruptcy. You should be able to substantially pay down or settle your debts within a reasonable time period such as 2 to 3 years. If this is impossible, you should probably get theChapter 7 debt release to start over. Do not get into a situation where you were just “spinning your wheels.” If a 2-3 year plan to reduce your debt is not possible, all signs point to you needing to file bankruptcy. Another sign that bankruptcy is right for you is when collection activity is destroying your ability to pay bills. If your wages start getting garnished, it may quickly become impossible to pay your monthly bills. A garnishment can easily “throw a wrench” into your finances that causes everything to shut down. A bank account freeze can have an even worse effect. Large amounts of money can become instantly frozen in your account. If acollection is becoming as aggressive as a bank account freeze, then it is probably time to file bankruptcy. When your credit future is on hold indefinitely due to defaulted accounts, you may need to file bankruptcy. Having bad credit can make life very difficult. It is also another clear sign that bankruptcy may be good for you. Do not put future dreams such as buying a house or other items on hold indefinitely. Protect yourself and provide for your future by exploring bankruptcy options. Bymaster Bankruptcy Law Offices Offers Free Consultations. To schedule your free initial visit, contact our office at 317-769-2244.